This week I found myself committing one of the first sins of running your own business – that is “not practicising what I Preach”. To cut a long story short – I present a lot of training seminars throughout the year which business owners are able to attend which are mostly free or very inexpensivce to attend. I thought it was the job of everyone else to promote them and not me! Easy mistake to make – wrong – it’s a lazy marketing mistake, one that stops now! So – in order to (w)right my wrongs – welcome to the first in my blog posting series called “forget Wally – where’s Todd?”. These posts will be dedicated to sharing with you information on where I am presenting my public training workshops, how to register and what they will include. These ones are being held with CRACC and SBFO as part of the HBBS and NAI how’s that for acronym overload!! 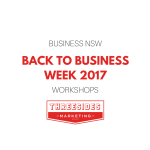 That will be one of the things you will learn in this workshop on Practical Marketing. Phew – and all this in 3 hrs of learning, activities and Q&A. Useful for all people in business who need to get a better grip on their marketing, where to start your marketing in a new business or just some fresh new ideas. Guranteed money back if you don’t learn something new (did I mention it is free?!). Two of the workshops are fully subscribed but 2 still have places so if you are keen to come along and learn something new please use the details below to register through the Small business field officer program (a great program that the federal government shouldn’t have cut funding to ) – but that’s a whole other blog post! This is an Australian Government funded service under the Small Business Field Officer Program and the Home-Based Business Seminar and Networking Arrangements Initiative.